Outside the Prague Estates Theatre. Don Giovanni puppets in Prague. Although Wolfgang Amadeus Mozart is generally associated with Vienna, the composer also had strong personal and professional ties with Prague. It was there, at the venerable Estates Theatre, that Don Giovanni had its world premiere in 1787, conducted by Mozart himself, and today the opera house stages several of his operas each year. One of the few European opera houses to escape renovation over the years, the Estates Theatre has remained so faithful to the age of Mozart that it was used for many of the opera scenes in Milos Forman’s 1984 film, Amadeus. Appreciation, of course, takes many forms. 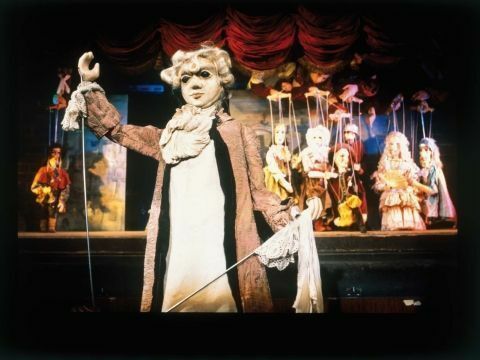 Ever since 1991, the National Marionette Theatre has been staging puppet shows of Don Giovanni, a near-continuous commitment that has raised the curtain on around 5,000 shows and spawned tours of over 70 cities throughout Europe, Asia, and Africa. Czech puppetry hails from a long and respected tradition, going back to the itinerant puppet masters at the end of the 18th century and the establishment of professional puppet theaters in the 1920s. Using hand-carved, painted marionettes manipulated by strings (and sometimes a hand rod), puppeteers have developed a repertoire recreating a variety of Czech folk tales and historical events. But were they up to doing opera? As I entered the small Art Deco theater on Zateck Street in Stare Mesto towards the end of a recent weeklong visit to Prague, I was skeptical. The cheesy-looking army of puppets — creepy golems, Good (if gnarled) King Wenceslases, assorted knights and knaves — I’d seen lurking in the windows of Prague’s souvenir shops seemed more likely to figure in nightmares than anything related to Mozart. Around me in the audience, subdued clusters of Japanese and American tourists were recuperating from the day’s sightseeing. A smattering of Czech families soon trickled in; I gathered a few of the children were repeat visitors. The lights dimmed, the crescendo of a tuning orchestra sounded from speakers to the sides of the stage, and a scruffy, bewigged head popped up from the small imaginary orchestra pit in front of the stage to take an elaborate bow. This was Mozart himself (in puppet form), ruffled collar and all, primed to recreate the 1787 premiere. With an exuberant jerkiness, he began to conduct the phantom orchestra in the pit through the overture. Once the curtain went up, I was surprised by how easy it was to make out the puppetsí strings, not to mention the actual hands of the puppeteers pulling them above the screen that served as the backdrop. Yet what the show lacks in realism it makes up for with irreverent humor — rather than trying to hide the puppeteers, it actually plays up their existence. The one charged with manipulating Don Giovanni’s servant Leporello, for instance, is so eager for the performance to end that he keeps pointing impatiently at his watch, finally tossing the poor puppet aside and stalking off in a huff. The puppets themselves are used to great melodramatic effect, shaking and swooning during their arias in a histrionic parody of the opera coming through the speakers. And meanwhile, in the orchestra pit below them, Mozart takes to the bottle, growing increasingly drunk and even passing out at one point. Despite the onstage irreverence, the puppet version of Don Giovanni is entirely faithful to the original, and only the most humorless of Mozart purists might take offense. The night I went, there were none in attendance, and the performance was very well received. Lasting just under two hours (including a 20-minute intermission), Don Giovanni is a slightly abridged version of the real thing. Very young children might find it overly long, and it’s definitely advisable to arrive early to familiarize them with the plot (there’s a synopsis in the program). But with tickets priced as low as 590 Czech crowns (US$23) for adults and 490 Czech crowns (US$19) for children, it’s a worthwhile introduction to high culture even if you only make it through intermission. The Estates Theatre is part of Prague’s famous National Theatre and there is always something going on, on one of their stages. Marionette Theatre performances are given throughout the year at 8pm every evening except Wednesdays. For more information, ticket prices and schedules, visit the National Marionette Theatre site.